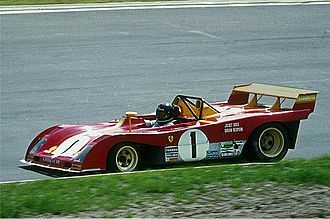 The Ferrari P was a series of Italian sports prototype racing cars produced by Ferrari during the 1960s and early 1970s. 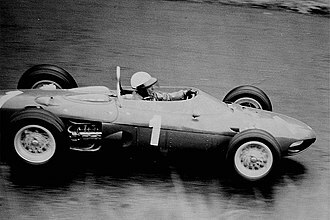 Although Enzo Ferrari resisted the move even with Cooper dominating F1, Ferrari began producing mid-engined racing cars in 1960 with the Ferrari Dino-V6-engine Formula Two 156, which would later be turned into the Formula One-winner of 1961. Sports car racers followed in 1963. Although these cars shared their numerical designations (based on engine displacement) with road models, they were almost entirely dissimilar. The first Ferrari mid-engine in a road car did not arrive until the 1967 Dino, and it was 1971 before a Ferrari 12-cylinder engine was placed behind a road-going driver in the 365 GT4 BB. Ferrari produced the 250 P in 1963 in response to the FIA introducing a prototype class for the upcoming season of the World Sportscar Championship. This was a new design, with a chassis unrelated to existing 250-series Grand Touring cars. Designed by Mauro Forghieri, the 250 P was an open cockpit mid-engined rear wheel drive design, utilizing a tubular space-frame chassis, double wishbone suspension, rack and pinion steering, four wheel disc brakes and a longitudinally-mounted V12 engine with a 5-speed gearbox and transaxle. The 250 Testa Rossa-type single-cam 3.0-litre engine was supplied by six Weber 38 DCN carburetors and produced 310 bhp at 7,500 rpm. This was the first time a V12 engine was mounted in the rear of a Ferrari sports racing car. The 250 P achieved immediate success on the racetrack, winning the 1963 24 Hours of Le Mans, 12 Hours of Sebring, 1000 km Nürburgring, and Canadian Grand Prix. 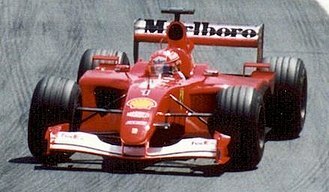 The cars were raced by Scuderia Ferrari in Europe and NART in the Americas. Notable drivers included John Surtees, Ludovico Scarfioitti, Willy Mairesse, Lorenzo Bandini and Pedro Rodriguez. In total Ferrari produced four 250 P chassis (serial numbers 0810, 0812, 0814 and 0816) and one development mule based on a Dino 246 SP chassis (number 0796). All 250 P chassis were converted to 275 P or 330 P specification following the 1963 racing season. For the 1964 season, Ferrari developed the 275 P and 330 P. These were improved versions of the 250 P with larger displacement engines and slightly modified bodywork. The tubular space-frame chassis and most other components remained the same as in the 250 P. The 275 P used a bored-out 3.3L version of the 250 Testa Rossa-type engine originally utilized by the 250 P. The 330 P used a different design, a 4.0L Colombo-designed V12 based on engines used in the 400 Superamerica road cars. The 330 P developed more power than the 275 P (370 bhp vs 320 bhp) but weighed more (785 kg vs 755 kg). Some drivers preferred the extra power of the 330 P while others appreciated the more nimble feel of the 275 P and the two models were raced concurrently. 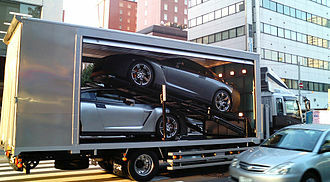 Production of these types included three brand new chassis and conversions of all four 250 P chassis. It is not possible to clearly determine the number of chassis produced with each engine type as 275 and 330 engines were swapped as needed between cars. 275 P and 330 P cars were actively and successfully raced by Scuderia Ferrari, NART and Maranello Concessionaires during 1964 and 1965 seasons. The most notable result was a 1-2-3 sweep at the 1964 24 Hours of Le Mans. 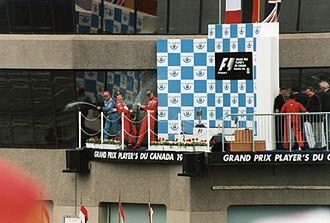 The Scuderia Ferrari-run 275 P driven by Guichet and Vaccarella took first, followed by a Maranello Concessionaires 330 P (Hill/Bonnier) in second and a Scuderia Ferrari 330 P (Bandini/Surtees) in third. At the November 1963 Paris Auto Show, Ferrari introduced the 250 LM (Le Mans). It was developed as a coupe version of the 250 P and was ostensibly a new production car intended to meet FIA homologation requirements for the Group 3 GT class. The intention was for the 250 LM to replace the 250 GTO as Ferrari's premier GT-class racer. However, in April 1964 the FIA refused to homologate the model, as Ferrari had built considerably fewer than the required 100 units. The 250 LM thus had to run in the prototype class until it was homologated as a Group 4 Sports Car for the 1966 season. 32 total 250 LM chassis were built from 1963 to 1965, with all but the first chassis (s/n 5149, the Paris Auto Show car with a 250 P engine) powered by 3.3-litre 320 bhp (238 kW) engines as used in the 275 P. According to Ferrari naming convention, the 3.3 litre cars should have been designated "275 LM", however Enzo Ferrari insisted that the name remain 250 LM in order to facilitate the homologation process. The 250 LM shared fully independent double wishbone suspension, rack and pinion steering, four wheel disc brakes and 5-speed transaxle with the 250 P, however the tubular space frame chassis was significantly strengthened with the roof structure, additional cross-bracing and heavier gauge tubing. The interior was trimmed out as a nod to the ostensible production status of the car, but ultimately it was little different from a prototype racer. The 250 LM was successfully raced around the world by both factory-supported and privateer racers. Unlike the 250/275/330 P cars, new 250 LMs were sold to private customers and campaigned by privateer teams. From 1964 through 1967, 250 LMs were raced by Scuderia Ferrari, NART, Maranello Concessionaires, Ecurie Filipinetti, Ecurie Francorchamps and others, even when this model was no longer competitive with the latest factory prototypes. Notably, a 250 LM (chassis 5893) entered by the North American Racing Team won the 1965 24 Hours of Le Mans driven by Jochen Rindt and Masten Gregory. This remains Ferrari's last overall victory in the endurance classic. This car is now owned by the Indianapolis Motor Speedway Museum and was displayed at the 2004 Pebble Beach Concours d'Elegance and the 2013 Amelia Island Concours d'Elegance. The 250 LM is highly sought-after by serious auto collectors and individual cars are often featured at auctions, car shows and historic racing events. 250 LMs typically sell for more than $10 million USD and auction records for this model have been repeatedly broken in the past 10 years. Two entirely new cars, the 275 P2 and 330 P2, followed in 1965. Featuring lower and lighter chassis and more aerodynamic body, the cars were paired with revamped versions of the previous 275 and 330 V12, now equipped with four camshafts and producing 350 hp and 410 hp, respectively. The 330 P2 was first used by Luigi Chinetti's North American Racing Team (NART) in the Daytona race that year. In 1965 275 P2 0836 won the 1000 km of Monza, 275 P2 0828 won the Targa Florio, 330 P2 0828 won the Nurburgring 1000 km, and 365 P2 0836 or 0838 won the 12 hr. Reims. The P2 cars were replaced by the P3 for 1966. For 1965 Ferrari also built a customer version of P2 cars; they were equipped with a SOHC 4.4 L engine and thus were named 365 P2. In 1966 Ferrari upgraded their 365 P2 cars with new bodywork by Piero Drogo. The 1966 330 P3 introduced fuel injection to the Ferrari stable. It used a P3 (Type 593) transmission whose gears were prone to failure. There are no longer any Ferrari P3s extant as the original P3 0846 was converted to a P3/P4 and definitively written off and scrapped by Ferrari due to previous accident damage and fire damage it sustained at Le Mans 1967, and P3s 0844 and 0848 were converted to P3/412 Ps by Ferrari. 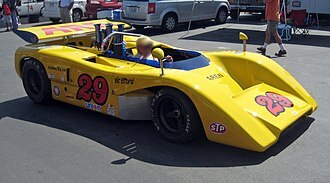 At a later point P3/412P 0844 was converted by Ferrari to a 330 Can-Am and in the 1990s returned to P3/412P configuration in private ownership. There are only two cars that were originally built as 412 P's: 0850 and 0854. P3 chassis. P3 Typo Motors except for Carburetors in place of FI. P4 suspension 0844 and 0848 were originally P3 Factory Racecars but when Ferrari sold them to customers they removed the Lucas Mechanical Fuel Injection and replaced it with Weber carburetors which reduced their output, something Ferrari wanted to do so that they would win points but not beat the factory cars which were then P4 0846 (See Above), P4 0856, P4 0858, and P4 0860. 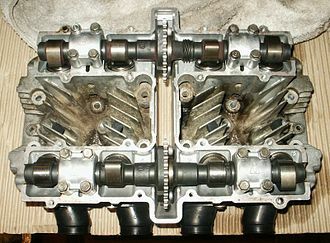 The P3's and 412 P had the same 4-liter block which is different from the P4-4 liter block and all had P3 not P4 chassis. All of the P3 chassis were made in 1966 at the same time but because of labor strikes only three of the five P3 chassis were built up into cars in 66. The unbuilt up P3 chassis were eventually build up into 412P 0850 and 0854 in 1967. P4 0846 was unique having, after modification by Ferrari for the 1967 race season, a P3 chassis with a P4 engine. 0844 Originally a works Berlinetta was converted by Ferrari from a P3 to into a customer concessionaires P3/412 P, then by Ferrari and NART to an open barchetta 330 Can Am, and is currently in Germany fitted with a Berlinetta 412 P body. 0848 Originally a works Berlinetta was converted by Ferrari from a P3 to a customer concessionaires P3/412 P and is currently in Switzerland. 0850 Originally a customer concessionaires Berlinetta, was at one time, in private ownership, converted for road use as a spyder but was later refitted with a Berlinetta body and is currently owned by an American. Ferrari Classiche restoration completed in 2017. 0854 Originally a customer concessionaires Berlinetta, in private ownership was heavily burned out and "virtually destroyed" at a race in East London, S.A. 1969 when it had an open/barchetta GRP body fitted to it by modifying and cutting the rear of chassis. The remains were rebuilt, again as an open barchetta and then further rebuilt into a 412P esque Spyder and used on the road. It has now been returned to Berlinetta configuration using the original front and rear clips and doors but the main centre part of the body, roof and sills have been remade in the US where it is owned. 1967 was a banner year for the Enzo Ferrari motor company, as it saw the production of the mid-engined 330 P4, a V12-engined endurance car intended to replace the previous year's 330 P3. Only four Ferrari P4-engined cars were ever made: three new 330 P4s and one ex P3 chassis (0846). 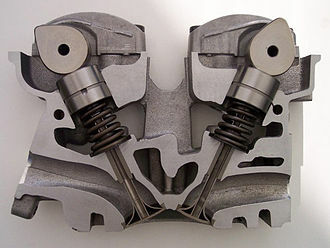 Their three-valve cylinder head was modeled after those of Italian Grand Prix-winning Formula One cars. To this was added the same fuel injection system from the P3 for an output of up to 450 hp (335 kW). The P3 won the 1000 km Monza in 1966, and the P4 won the same race in 1967. Two P4s, and one 412 P crossed the finish line together (in first 0846, second 0856, and third place 0844) in the 1967 24 Hours of Daytona, for a photo finish to counter Ford's photo of the Ford GT40 Mk.II crossing the finish line together First, Second, and Third at the 1966 24 Hours of Le Mans. Since then, the fate of these four cars has been the subject of much attention. 0846. Built in 1966 as the first of 3 works 330 P3s and the only P3 Spyder. Retained by the works at the end of 1966 and used as the basis for the new P4 and partially converted to P4 specification for 1967. Ferrari states 0846 no longer exists. It was decided by the factory to scrap the chassis due to its previous accident history and fire damage sustained at Le Mans, 1967. The original chassis number has been written off Ferrari's books as an existing chassis, but the number is still in their ownership. After boycotting sports car racing in 1968 to protest the rule change, Ferrari built another 3000cc prototype in 1968, named the 312 P.
The 3.0 Ferrari 312P Barchetta and 3.0 Ferrari 312P Berlinetta were hardly more than 3-litre F1 Ferrari 312s with prototype bodies. At the 12 Hours of Sebring the spyder finished second to a JWA Gulf Ford GT40. At the BOAC 500 at Brands Hatch the same spyder was fourth behind three Porsche 908-01s. At 1000km Monza, Chris Amon took the pole with the 312P spyder, ahead of Jo Siffert's 908-01, but had to retire. At the 1000km Spa, a 312P was second, behind the Siffert-Redman 908-01LH. At Le Mans two 312P Berlinettas were entered. They were five and six on the grid, but did not finish. 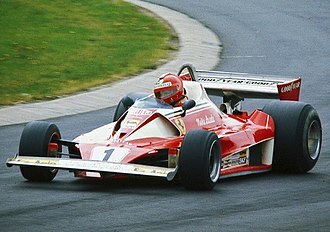 At the end of the season the 312Ps were sold to NART, the American Ferrari importer of Luigi Chinetti. In 1971, another rule change was announced for 1972, and Ferrari abandoned further development of the 512M in order to focus on a new 3 Litre prototype based on the 312B F1 car. The 312P would prove fast but fragile in its debut at the 1971 Sebring 12 hours. Further development over the 1971 season brought increased reliability. The press added a "B" to 312P. 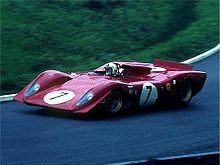 Ferrari official records: Ferrari 312 P.
The 312Ps with the flat-12 boxer engine were very successful, winning ten out of eleven races in the 1972 World Championship for Makes and delivering the title to Ferrari. 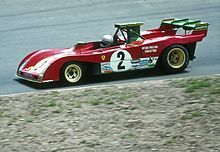 Scuderia Ferrari didn't enter the 1972 24 Hours of Le Mans, as Enzo Ferrari thought that the F1-based engine could not last the full 24 hours. He would be proven wrong. The team competed in the 1973 24 Hours of Le Mans and finished second behind Matra, which would also be the teams' final standing in the 1973 championship. At the end of the 1973 season, Ferrari was forced by chief investor FIAT to abandon sports car racing, instead focusing on F1. ^ a b c "The 250 P - The First of the Great Prototypes". Cavallino. 36: 12–20. December 1986. ^ a b "Ferrari 250 P (1963) - Ferrari.com". Ferrari GT - en-EN. Retrieved 2018-08-31. ^ a b c d e 1927-1975., Tanner, Hans, (1979). Ferrari. Nye, Doug. (5th. ed.). Yeovil: Haynes. ISBN 0854292381. OCLC 6943577. ^ a b "RM Sotheby's - 1963 Ferrari 275 P | Private Sales". RM Sotheby's. 2018-08-22. Retrieved 2018-08-31. ^ "246 SP s/n 0796". www.barchetta.cc. Retrieved 2018-08-31. ^ "250 P s/n 0810". www.barchetta.cc. Retrieved 2018-08-31. ^ "250 P s/n 0812". www.barchetta.cc. Retrieved 2018-08-31. ^ "250 P s/n 0814". www.barchetta.cc. Retrieved 2018-08-31. ^ "250 P s/n 0816". www.barchetta.cc. Retrieved 2018-08-31. ^ "330 P - Born to Run". Cavallino. 44: 32–39. April 1988. ^ "Ferrari 275 P (1964) - Ferrari.com". Ferrari GT - en-EN. Retrieved 2018-09-01. ^ "Ferrari 330 P (1964) - Ferrari.com". Ferrari GT - en-EN. Retrieved 2018-09-01. ^ Prunet, Antoine (1983). Ferrari : Sport Racing and Prototypes Competition Cars. New York: Norton. ISBN 0393017990. OCLC 10382200. ^ "The Maranello concessions racing team | Motor Sport Magazine Archive". Motor Sport Magazine. 2014-07-07. Retrieved 2018-09-01. ^ "1964 Le Mans 24 Hours | Motor Sport Magazine Database". Motor Sport Magazine. 2017-06-13. Retrieved 2018-09-01. ^ Twite, Michael L (1971). The World's Racing Cars, Fourth Edition. Macdonald. p. 114. ISBN 0356031551. ^ a b c "LM Part I - The Story of the 250 Le Mans". Cavallino. 28: 24–29. July 1985. ^ a b "Ferrari 250 LM (1963) - Ferrari.com". Ferrari GT - en-EN. Retrieved 2018-09-01. ^ "250 LM - Index". www.barchetta.cc. Retrieved 2018-09-01. ^ "Ferrari 250 LM - Photo Gallery - Racing Sports Cars". www.racingsportscars.com. Retrieved 2018-09-01. ^ "1965 Le Mans 24 Hours report". Motor Sport Magazine. 2013-06-19. Retrieved 2018-09-01. ^ Stambler, Irwin (September 1985). "The Little LM That Could". Cavallino. 29: 18–27. ^ "The Last Ferrari To Win The 24 Hours of Le Mans - The 1965 Ferrari 250 LM At Amelia Island". mycarquest.com. ^ "250 LM 5893". www.barchetta.cc. Retrieved 2018-09-01. ^ "1964 Ferrari 250 LM sells for $9.625 million, breaking Arizona auction price record". www.hemmings.com. Retrieved 2018-09-01. ^ Katya Kazakina (22 November 2013). "Ferrari 250 LM Sells for Record $14.3 Million in New York". Bloomberg. ^ "This Collection Of Supercars Just Set Auction Records". Fortune. Retrieved 2018-09-01. ^ "1964 Ferrari 250 LM by Carrozzeria Scaglietti". RM Auctions. Retrieved 2018-08-31. ^ "RM Sotheby's - 1964 Ferrari 250 LM by Scaglietti | Monterey 2015". RM Sotheby's. 2018-04-13. Retrieved 2018-09-01. ^ "Ferrari 330/P4". Road & Track (May 1967): 114–116. 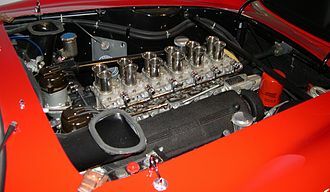 Wikimedia Commons has media related to Ferrari P.
The Ferrari Colombo Engine was a 60° petrol fueled, water cooled, carburetted V12 designed by Gioacchino Colombo produced in numerous iterations by Italian automaker Ferrari between 1947 and 1988. Colombo had formerly designed Alfa Romeos for Enzo Ferrari and these V12 powerplants ranged from the diminutive 1.5 L unit fitted to the 125S to the 4.9 L unit in the 1986 412i. 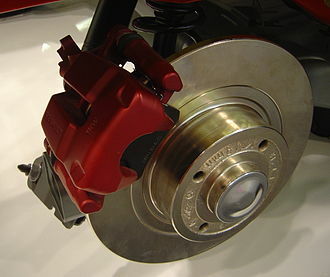 Significant updates were made in 1963 for the 330 series featuring a block with wider bore spacing. 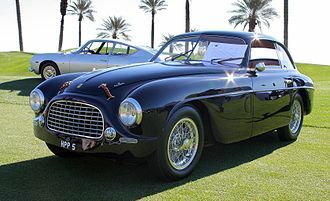 Enzo Ferrari had long admired the V12 engines of Packard, Auto Union, and Alfa Romeo, but his first car, the 1940 Auto Avio Costruzioni 815, used a Fiat straight-8. Although Lampredis engines were a force for the company, it was Colombos V12 which would be the primary motivator for the companys consumer products through the 1950s and 1960s. 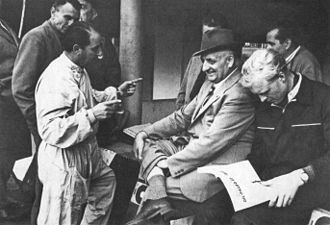 The first homegrown Ferrari engine was the 125, first appearing May 11,1947 under the hood of Ferraris 125 S sports racer, the engine allowed the company to claim six victories in 14 races that year. The 125 S sported tiny 55.0 mm by 52.5 mm cylinders, the resulting 124.73 cc of each cylinder rounded up to give the engine, the engine displaced exactly 1,496.77 cc. It had an overhead camshaft on each bank of cylinders with a 60° angle between the two banks. The engine had two valves per cylinder fed through three Weber 30DCF carburettors, a 7.5,1 compression ratio yielded 118 hp at 6800 rpm. 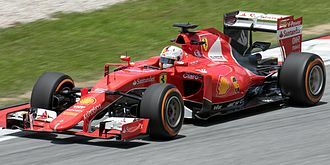 Colombo and Ferrari had designed the engine with Formula One regulations in mind, and introduced it the year in the companys first F1 car. This time, it was supercharged, in accordance with F1 dictates, the Roots-type single-stage supercharger was incapable of producing the high-end power required to compete with the strong eight-cylinder Alfa Romeo 158 and four-cylinder Maserati 4CLT. Strong driving and a chassis, allowed the company to place third in its first outing, at the Valentino Grand Prix on September 5,1948. 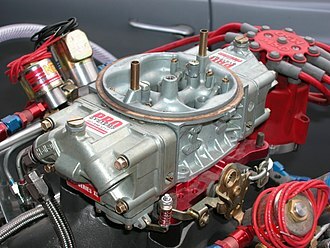 For 1949, the engine was modified with dual overhead camshafts. 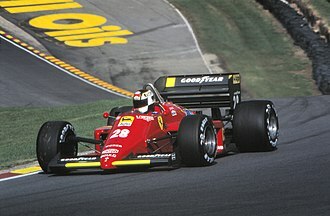 This combination gave the car better top-end performance and the resulting 280 hp gave it five Grand Prix wins, development continued the following year, but the problematic superchargers were dropped in favor of larger displacement and Lampredis 275 engine superseded the original Ferrari engine. John Surtees, CBE was an English Grand Prix motorcycle road racer and Formula One driver. He founded the Surtees Racing Organisation team that competed as a constructor in Formula One, Formula 2 and he was the ambassador of the Racing Steps Foundation. Surtees was the son of a south London motorcycle dealer and he had his first professional outing, which they won, in the sidecar of his fathers Vincent. However, when officials discovered Surteess age, they were disqualified. He entered his first race at 15 in a grasstrack competition, in 1950, at the age of 16, he went to work for the Vincent factory as an apprentice. He made his first headlines in 1951 when he gave Norton star Geoff Duke a strong challenge in an ACU race at the Thruxton Circuit, in 1955, Norton race chief Joe Craig gave Surtees his first factory sponsored ride aboard the Nortons. He finished the year by beating reigning world champion Duke at Silverstone, in 1956 Surtees won the 500cc world championship, MV Agustas first in the senior class. In this Surtees was assisted by the FIMs decision to ban the defending champion, Geoff Duke, in the 1957 season, the MV Agustas were no match for the Gileras and Surtees battled to a third-place finish aboard a 1957 MV Agusta 500 Quattro. When Gilera and Moto Guzzi pulled out of Grand Prix racing at the end of 1957, Surtees and MV Agusta went on to dominate the competition in the two larger displacement classes. In 1958,1959 and 1960, he won 32 out of 39 races, in 1960, at the age of 26, Surtees switched from motorcycles to cars full-time, making his Formula 1 debut racing in the 1960 BRDC International Trophy at Silverstone for Team Lotus. On 25 September 1965, Surtees had an accident at the Mosport Circuit while practising in a Lola T70 sports racing car. A front upright casting had broken, baime in his book Go Like Hell says Surtees came out of the crash with one side of his body four inches shorter than the other. Doctors set most of the breaks nonsurgically, in part by physically stretching his body until the right-left discrepancy was under an inch –. 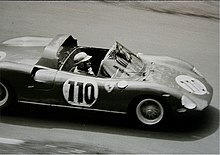 Bonnier at 1962 German Grand Prix driving a Porsche 804. Fans fill up a grandstand. The Jaguar XJR-8, Group C, produced over 700 horsepower. 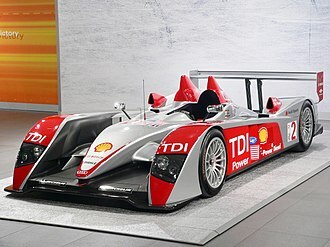 The Audi R10 is one of the most successful Le Mans Prototypes in recent years, winning 36 out of 48 races, and 4 Constructors' Championships.